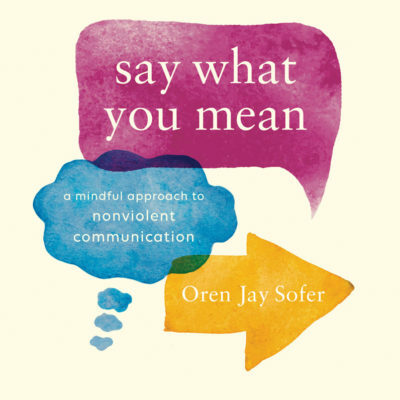 Typically, the term ‘street giraffe’ is synonymous with the notion of naturalizing [NVC] which indicates a less formal and more colloquial way of embodying Nonviolent Communication (not necessarily adhering strictly to the [OFNR] form, while still retaining the substantive purity of its consciousness); most especially in a way that may be more connecting and approachable in everyday dialogue. Miki Kashtan: “I’m curious to know how many people have irritated people in your life by how you speak with NVC? So, if I use NVC that is not fully integrated, then in a certain small way, I am imposing my practice on other people. So I want to take a moment of silence, as for me, this insight was of great depth for me, when I finally got it. Than we find ourselves in a very difficult situation. We no longer want to use the old ways but we don’t have the new ways integrated. Be careful now, as you are at your most vulnerable. One is to learn some techniques for making the language sound more natural. Second is to have enough self-acceptance to let go of trying to use NVC with people, that are not NVC speakers, and just be spontaneous and let things happen. We all survived many years of living without NVC. Another teacher, Miki Kashtan (author of a series of articles on Gandhian Principles for Everyday Living) often intentionally re-frames NVC as something beyond a pure self-discovery/personal-growth modality (in keeping with the nonviolent, civic-minded tradition from which it stems). I once heard an anecdote of how to frame the arc of acquiring NVC skills (or embodying its consciousness), which seems particularly relevant to any discussion as to ‘streetifying’ NVC. Borrowing from what I can only assume to be the psychoanalyst, Lawrence Kohlberg, and his stages of moral development, learning NVC was similarly broken down into three stages: pre-conventional, conventional, and post-conventional. To delineate between these, first imagine a toddler — representing “pre-conventional” — assembling an outfit that mixes stripes, polka dots and a lady-bug patterning. Next, envision the same little girl, now an adolescent, and fervently wishing to blend in with the “conventional” milieu of her peers by wearing the same name brand jeans and sneakers (so as not to stand out!) as everyone else. Finally, see her as an adult professional at Manhattan’s fashion week — a top notch designer of haute couture — assembling those seemingly bizarre “post-conventional” ensembles. To the untrained eye, the post-conventional of high fashion costuming is not all that dissimilar to the “pre-conventional” polka-dots/stripes/lady-bug patterning. But now the creative self-expression seems quite deliberate, of conscious intent/design, as there’s a method to the ‘madness’. I’ll say more at this ‘heterodox’ or ‘avant-garde’ approach at bottom, referencing a Mandela tactical approach to nonviolence, rather than Gandhi/King principle-centric one. Q: Did you say that your greatest guru is Francis Bacon? Q: How did he influence you? He wrote… You know there’s a book called Interviews with Francis Bacon and he put forth the concept that, at that time I just hadn’t thought of, of the tension between inspiration and technique. And the way that accident is very important in art. But that you can only achieve accident, in a full way, after you’ve fully mastered technique. In other words he said, you know it’s true, that children under the age of seven are all — every single one of them — a genius painter. They’re genius because it’s totally instinctive. But you can’t be painting as a seven year old when you’re fourteen. So, you know, you have to move forward. And then you go through this painful process of learning technique when you’ve lost all your instinct, you’ve lost all your inspiration, and you’re just learning how to draw a foot. You know. And then you get through that and now you can allow accident to happen. You’re open to accident. You’ve got all the technique, you’ve got all that, it’s so deep within you that you don’t even have to think about it, it’s got to become thoughtless the technique, and then you can allow inspiration to come back. The master of this is Al Pacino. The absolute master. He’s a master of allowing — he’s totally technical — he knows where the camera, every mark, he hits every mark, never fails, you know. He knows the cutting, the editing, and then within that very structured form, which film is, very, you know, very tight — he’s utterly free and it’s just so inspiring to be around. On a Heterodox or Avant-garde approach to a Nonviolent Ethos….